If you are reading this as a fellow college student, there is one thing we can all agree on; anything labeled free is an open invitation. So for an English/Theater Major, when you mix the words free and Shakespeare together, I start to drool. 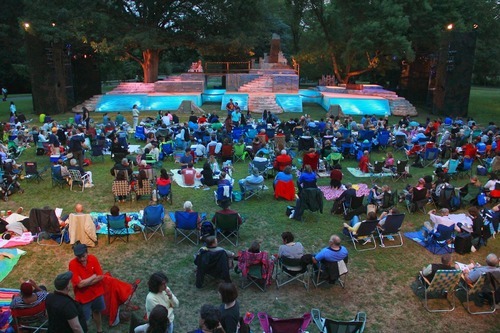 Seeing Pericles in New Haven was not my f﻿irst walk in the p﻿ark; I have frequented numerous Shakespeare in the park events, all of which offer a fun, enjoyable night for the wondrous price of free. Theater, even bad theater is always enjoyable. Yet something about the combination of free and Shakespeare tends to create a theater experience unlike any other. It is not simply the play that you watch, but the people as well. It is impossible to attend a free play in a park without noticing the different types of people who gather at these events. You have a wide variety of people ranging from young to old. There are a select few, however, that make the whole theater experience worthwhile. The first type you may encounter is the couple who wrongly decided not to hire a babysitter for the night- or as I like to call them, Regret-Me-Nots. Most often, they will be the ones who put down their folding chairs in the already crowded space in front of you, effectively blocking your view while their child runs around and stomps all over your stuff. They are blissfully ignorant to the noise and utter chaos their child is creating. Of course, every time you ask them if they can reign in their child, they give you the kids will be kids speech…or pretend you don’t exist. Regret-Me Nots should be filled with regret over not wisely choosing to get a babysitter for the night, but for some reason can never bring themselves to care enough. As a young adult, my heart goes out to the Bored-Out-Of Their-Minders, or high school students who are only attending the event for a school assignment. These poor, unfortunate souls always come unprepared for the terrain, with nothing to sit on and a pencil in hand. If they are not dozing off at the start of the second act, they are sitting in a horribly uncomfortable position, furiously writing notes in the margins of a page. Of course, with technology now-a-days, many of these Bored-Out-Of Their-Minders can waste away the time in a zombie-like trance, staring intently into their phones. A quiet shout of the words “pop quiz” can knock these poor guys out of their trance and into a frenzy. Every now and then, if you’re lucky, you run across the Oldie-But-Goodies. These lovely men and women are the kind and adorable elderly folks, who remind you of your own grandparents. If you are fortunate enough to find yourself next to an Oldie-But-Goodie, you will be given the grandchild treatment where you engage in delightful small talk and are offered extra blankets or tissues throughout the night. Just when you thought it couldn’t get any better sitting next to such a wonderful person, an Oldie-But-Goodie, more often than not, shares your love for people watching and does not tolerate the Regret-Me-Not parents’ behavior. They will not hesitate to point out an intolerable child and guilt the parents into doing something about their kid’s behavior. Of course, you simply cannot forget the Bougie-Bots, those who bring with them a five-star picnic including toast points, caviar, smoked salmon, mini quiche, crème Brule, and only the finest champagne. These lovely folks turn up their noses at anyone who does not meet their sophisticated status quo expectations. You may take note that a Bougie’s superior dinner is not complete without mention of their prize winning show dog, Shnookems or their recent trip to the Yacht Club. Annoying as they may be, Bougie-Bots are altogether harmless. Generally, the only direct issue you may have with these folks is if youget too close to their VIP space on the ground; those encroaching on their hand-embroidered raw silk sitting mats will find themselves in for an earful of pretentious jibber-jabber in which a Bougie-Bot willpassive-aggressively talk about you for the rest of the night. But don’t worry, if they get too obnoxious, you can always count on your Oldie-But-Goodie pals to put the Bougie-Bots back in their place, just as they would with a Regret-Me-Not. Last, but not least, you have the poor college students who try their hardest to seem fancy, but are in fact Faux-Fancies. Unlike the Bougie-Bots, their wine costs $10 or less and the expensive meal they have brought along is actually Taco Bell from the drive-through down the road. Most of the fancies will scoff at you or complain about the smell, but in my opinion, their obvious disgust only makes the night more enjoyable for the rest of us. For a Faux-Fancy, there is nothing you can say or do-short of getting up on stage and joining the production that will change a Bougie-Bot’s opinion of you. If it’s not the fumes of cheap food bothering them, it’s the uncooperative weather, or simply being surrounded by people not of their status. One thing for a Faux-Fancy to keep in mind is to not be discouraged by a Bougie’s obvious lack of approval; take a hint from the rest of us, and let the others deal with the annoyances of a Bougie. After all, A Faux-Fancy is typically at these events to relax and have a good time; worrying about the comfort of a Bougie-Bot is not on their agenda. The next time you decide to attend a free play in the park, keep an eye out for the various types of people you will encounter. Scope out the area for the Oldies-But-Goodies or Bored-Out-Of Their-Minders for a quiet night of fun, or test your luck and patience sitting down near a Bougie-Bot or leaving enough room for a Regret-Me-Not. One thing is certain with a free show; no matter where you sit, you are sure to have an eventful night.